Aside of my french press, when I'm in a hurry, my 12 cup coffee maker is the next most used coffee machine by me (and I have more than 1!). 12-cup coffee are among the most popular coffee brewers. They are practical for those who drink lots of coffee, or for households with multiple drinkers, as well as for office use. Coffeemakers with multiple warming plates to heat more than one 12-cup pot at a time -- such as Bunn's 12-cup commercial-grade coffee maker series with multiple decanters that are found in many offices, community centers, groceries, etc..
Standard twelve cup coffee makers are usually quite affordable. 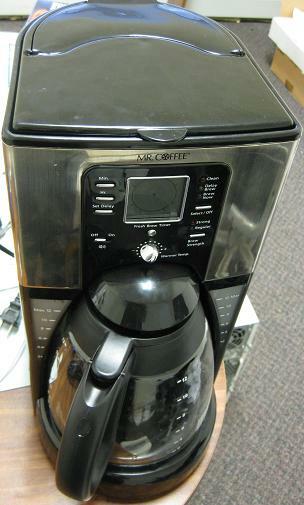 A good Mr. Coffee® machine, for example, can be bought for $30 something, while some switch (non-programmable) coffee makers may be available for even less than $10. One thing to keep in mind: when talking about 12cup coffee makers, small-sized 5-oz coffee cups are usually intended (except for a French Press, where a "cup" often refers to 4-oz capacity "cups"). Cuisinart DCC-1200 12-Cup Brew Central coffeemaker. Heating element warming the coffee up to 2 hours. Shower head is separate from the lid (you have to turn it over the grounds to close the lid). Coffee is NOT super hot, if that's what you like. The Mr. Coffee 12 cup coffee maker model# FTX41CP is better than the one featured here on the left. The Cuisinart DCC-1200 12 Cup Brew Central coffee maker is a nice, attractive, well-built coffeemaker. It has a Retro-style, brushed metal and black finish. It's simple and easy to operate. I vote for the FTX41CP vs the BVMC-SJX33GT model, if you can afford it. See a more detailed comparison review between the FTX41CP and BVMC-SJX33GT - and videos of both here. Check out coffee maker instructions for both Mr. Coffee machines here. Cuisinart DGB-700BC Grind-and-Brew 12 Cup Coffee maker, Brushed Chrome/Black. This is a Cuisinart automatic grind and brew coffeemaker grinder. It does both the grinding of whole beans and the brewing of the fresh ground. It brews up to 12 cups (small size) and makes good and hot coffee. It mills the beans with a bur grinder, which is better than a blade grinders. It has programmable features and controls allowing to program and automate the grinding and brewing; a strength selector to select the strength of the coffee to weak, mild or strong; auto shutoff; permanent filter; and a water filter to purify the water. It features an 8-ounce bean hopper that contains half a pound of beans, so you don't have to refill every time. A sealed lid keeps it away from moisture. The grind & brew 12 cup coffee maker carries a 3-year limited warranty by the manufacturer. Because ground can clog the chute where the beans are led from the grinder to the brewer, it is important to clean it after servings, which must not take long but can be a pain for some. BUNN VPR Commercial 12-Cup Pour-Over Coffee Brewer. This 12 cup coffee maker is a commercial coffee machine, useful for places where there are many coffee drinkers. It is not a home coffee maker. It comes with 2 Warmers that are separately controlled, so you can brew one batch while serving the other, or your can brew one pot of regular and one of decaf coffee. The decanters, however, are sold separately. It requires no plumbing. It brews over 3 gallons of coffee per hour. It does not have an automatic shut-off feature, so if you leave it brewing for a long time the coffee can be burned and you’ll be left with a mess to clean up. Priced at over $200 (at the time of this writing), this is not a cheap coffee maker, but it is a good investment. It makes great coffee and a lot at a time. BUNN VPS 12-Cup Pourover Commercial Coffee Brewer, with 3 WarmersThis one is a 12 cup BUNN coffee machine similar to the above, only that it has 3 warmers instead of 2, so you can make even more coffee at once. 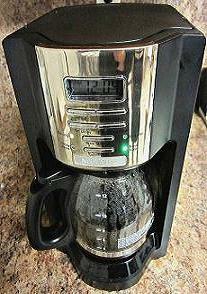 The 12 cup coffee maker is priced (at the time of this writing) at about $250. Again, be advised that the decanters may not be included. What Is Your Favorite 12 Cup Coffe Maker?